wanted to start this in a clean topic because this is a pretty exciting customization ability we were kinda bummed to have to wait for and i think alot of people will like this. goes in css_additional.css..
he has even put instructions into the code so you know how to adjust the spacing for your icon...so easy! Last edited by IggyP; Wed 9th Apr '14, 11:42am. Thanks IggyP for sharing this. Change 114 to the actual channelid of the target forum found in the data-channel-id attribute in the corresponding <tr> element of the forum in the HTML source. Then repeat for each forum. Last edited by Glenn Vergara; Thu 9th Jun '16, 1:23pm. Worked on a fresh install, so thats good. One major issue, any CSS added to site builder only acts on the default style, the other style have to have it added vis the acp as normal, is this a bug ? Last edited by Graham Walters; Sun 8th Jun '14, 8:58am. Choose the appropriate style you want to change using the Dropdown on the CSS tab. The CSS should apply to that style. If not, then it is a bug and you need to enter it in to JIRA. Right on it. Trying to get that changed so themes are more useful. is this where you put the image? Yes. 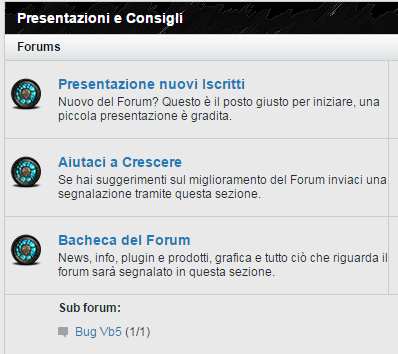 If the icons are located within your forum, you can use relative path. Otherwise, use absolute path. Last edited by Glenn Vergara; Wed 6th Jul '16, 10:26am. In the subforum it's not similar at home page, how resolve? Add the ones in red. I thought this came from an option in forum manage like vB4x, If using CSS to control images then it would not be more convenient for users.